PlayStation(R)3 computer entertainment system and Windows PC. The title will be available internationally on October 19, 2012.
industry's most successful and critically acclaimed series, which has sold-in over 9 million units worldwide. we can't wait for fans to get their hands on it." BioShock Infinite is not yet rated by the ESRB. For more information on BioShock Infinite please visit http://www.bioshockinfinite.com . Located near Boston, Massachusetts, Irrational Games is widely recognized as one of the industry's leading game developers. Freedom Force, and the original BioShock. For more information, visit http://www.IrrationalGames.com . 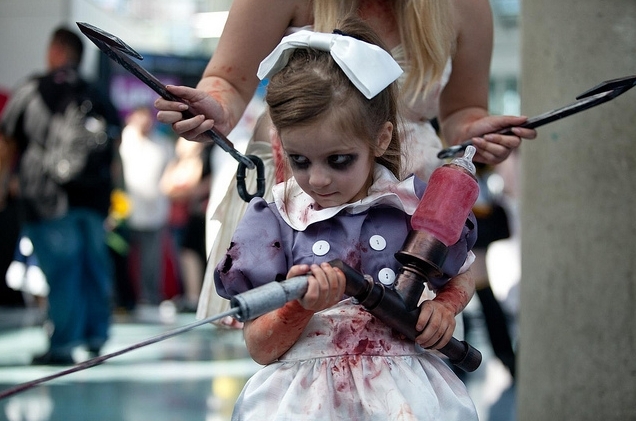 Don't believe there are any Little Sisters in Bioshock: Infinite, but still that's a crazy cool get-up. Gonna have to finish BioShock 2 at some point, not played it since I encountered a stupid glitch that set me back 5 or so bloody hours! I've got both 1 and 2, but haven't even gotten through the beginning of the first one yet. I'd better hurry up! Or then again, maybe I could just take it easy and not hurry through just because a new one is coming out. I have so many games to catch up on. I'd stress trying to play them all through before the new ones came out. But do you really need to play through the first two to play Bioshock Infinite? Wouldn't you kind of pick up on the basic premise of the game? You're right Mumsey, you don't need to play through the first two Bioshock games to get into "Infinite" but I'm betting that much like any other game, playing the latest first might cripple the experience of the older two. 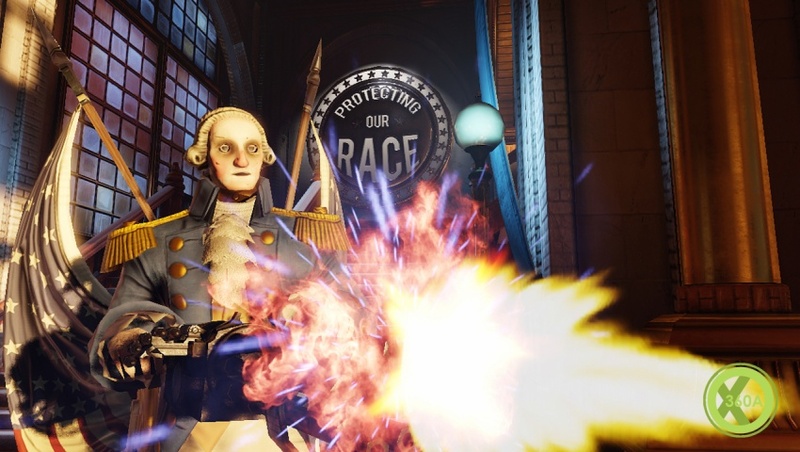 George Washington... First president of the USA, national American hero and now evil killer robot in BioShock Infinite. Irrational Games has today lifted the lid on the 'Motorized Patriot', a Gatling gun-toting mechanised George Washington who you'll encounter in BioShock Infinite's floating cloud city of Columbia. Revealed to be one of BioShock Infinite's so-called 'Heavy Hitters', the Motorized Patriot is one of many taxing bad guys who'll stalk the streets of Columbia, providing a stiff challenge for the game's hero, Pinkerton agent, Booker DeWitt. Speaking to Kotaku, BioShock Infinite Director, Ken Levine revealed a little bit about the Motorized Patriot's background. "His job is to sell people on the vision of Columbia. The Founders have this extremely grandiose vision of what their mission is, and the Motorized Patriot's job is to go around and sell that vision—at first." Naturally, everything goes to hell in handbasket, big time Rapture-style when the Patriots are weaponised with miniguns. "Also, the Vox Populi can hack them," explained Levine. "Later on, you'll come across Motorized Patriots who are sort of dressed up in Vox Populi colors, with different heads put on, representing one of their heroes. And they're working for the Vox Populi, spouting their propaganda." As you may know, the Vox Populi are one of Columbia's antagonistic factions, a ruthless resistance group fighting against the Founders. Levine was also quick to distance the Heavy Hitter from BioShock's Big Daddies. "There's gonna be a lot of interesting things in the game that I think remind people a lot of BioShock, but we're not really trying to sort of match anything nose for nose," he said. BioShock Infinite is coming on October 16th, 2012 in North America and October 19th, 2012 in Europe. Game pushed to next February "to deliver the best Infinite possible"
2K Games has delayed the release of BioShock Infinite from this October to February 26, 2013. Irrational Games creative director Ken Levine said: "When we announced the release date of BioShock Infinite in March, we felt pretty good about the timing. "Since then, we've uncovered opportunities to make Infinite into something even more extraordinary. Therefore, to give our talented team the time they need to deliver the best Infinite possible, we've decided to move the game's release to February." This evening has seen a flurry of announcements and reports surrounding Bioshock Infinite and the studio behind it, Irrational Games. Following the exit of a couple of high-profile staff yesterday, Irrational has announced that Gears of War executive producer Rod Fergusson has joined the team, while multiplayer modes have been dropped from Bioshock Infinite. Let’s start with Bioshock Infinite’s multiplayer. According to Kotaku, two planned co-operative modes have been been consigned to the cutting room floor. The first was a tower defence-type game in which miniature characters did battle against waves of toy-like enemies in an “old-timey arcade machine.” Which sounds odd. The second apparently had the working title of “Spec-Ops,” borrowing the basic structure of Modern Warfare game mode, with players teaming up against enemies in levels inspired by the single-player campaign. The news comes following the departure two key members of Irrational’s Bioshock Infinite team, director of product development Tim Gerritson and art director Nate Wells. Alongside Cliff Bleszinski, Fergusson was one of the figureheads of the Gears of War series, following a spell of eight years in an executive producer role at Epic Games.